Manu Chandaria is the chairman of Comcraft Group. The family business produces steel, plastics and aluminium products and has operations in 50 countries across the globe. In 2011, Forbes magazine valued the 98-year-old industrial conglomerate to be worth about US$2.5bn. 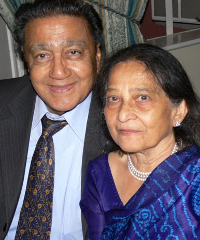 Chandaria has been heavily involved in philanthropic work in Kenya. I was a second engineer at Kaluworks where there was a team of 40 employees. Someone else who had worked at the plant for many years was my boss [and] I was number two [in command]. My parents, who encouraged us to build [the business]. I would say (Mahatma) Gandhi and his philosophy of good for everybody. The philosophy of great people like Tata (of Tata Group) in India, Rockefeller in America, Ford; they have two hands, two eyes, two ears and two legs. Why can they do 100 things more than you? They are my inspirations. But inspirations you can keep on reading and you can enjoy yourself [and] you get a little excited then it all goes, that is not me. I worry about the poverty of people here. I always worry about them when I go to see these children in the streets. We have moved 18,000 of them (street children) into homes, into a better life [and] some of them are working. I see these children on the streets. When I go to sleep at night and I take two blankets because it is very cold and they sleep under polythene [bags], that to me is just not acceptable. It hurts me. I feel pain, it really hurts me. I believe in truth. I believe in equality. I believe in hard work. I believe in honesty and integrity. These are the qualities that are fundamental… that keep me going. I think we’ve got good people, nice people. We’ve got educated people. We have the best climate that you can think of. We have got a whole coastline given to us and we think it’s ours, but forgetting… Uganda, Rwanda,South Sudan, Burundi, Congo and southern Ethiopia [rely on it]. Just because it’s ours does not mean that we have no responsibility. But that’s a beautiful coast we have got. We have lovely game and I think we have got everything good going for us. We are at a take off stage now. All we require now is a little push and understanding and rather than blame games, build positive attitudes. Yes, Westgate [terrorist attack] was bad but what have we got to learn from that? Will we just forget about it or are we going to learn from that? Tribalism [and] politics. Number one is politics. The worst thing about this country is politics. Politics has ruined our 50 years [of independence]. After 25 years we could have been celebrating being one of the good countries but we lost that because our politics is very divisive. They [politicians] put so much emphasis on tribes and there is this disparity; they don’t see beyond themselves. What about others? [About] 60% of our children go to sleep with one meal a day. Can’t they see that? Can’t they see the slums? Can’t they park their six beautiful cars and walk with me in the slums? Come and walk with me and I will tell you the pain. I think the worst part is that we are indifferent to our people; people are dying, we don’t care. That kind of attitude, of understating the pain of others, I think [is the thing] we have failed [at] miserably. [I have] very few years to live. That I know now because I am already 84 turning 85 before long. My future plan is to do as much good as I can. I hope that younger people get inspired from the stories of the work that I have done. No retiring – if you retire then you go down. As long as your mind is working and your body is working, you can manage to do things. My relaxation is work. If I can be useful to somebody for five minutes, I would rather do that than go and play golf or play anything else. God has given me good health. I have maintained my health and people ask me if I do so much exercise and I say, “no”. To me, if I can help an extra hour, I will spend that hour. I worry about them because there are too many of them in the streets. One time they asked me to address some clubs and they (youth) told me they would like to invest here and invest there. I told them investors will come [so] speak with them, but, tell me man, when you go home what do you find? You find children sitting, doing nothing. How long do you expect this to go on? You will die tomorrow then. Get up and work. I want a borderless Africa. I want Africans to walk one country to another country as they want. I want goods manufactured in one country to move to other countries. If Uganda has got more maize, let it come over here. If we have got more Mabati [iron sheets], let it go to Uganda. Let us be dependent on each other because we cannot hold unless we hold each other’s hands. The worst thing [here] is the sovereignty. This is the same East Africa where I lived until 1963 [when] we could walk into any country, use any shilling [currency], buy land… there were no restrictions. What have we done? For what? The East Africa community, we killed it. Now again we build it, again we are fighting in it. If we can’t learn from the lessons [of the past] then we are dumb. And Africans are not dumb. Let me explain to you, Africans are not dumb. [Africans] are ruthlessly deprived of every opportunity. Why would I be just begging in the street? Because there is no other avenue to make two ends meet.